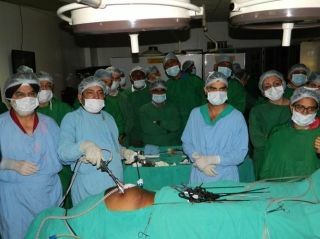 IPOM Laparoscopic Inguinal Hernia Surgery Demonstrated by Dr R K Mishra. Hands on Training in Minimal access Surgery on the Live Tissue. If hernia once get incarcerated it can't be pushed back, surgery has to be done sooner. It is not going to get better without surgery. Surgery is the sole method to fix a hernia, because they don't heal or resolve otherwise. In case of adults, he might be recommended if the protrusion is big, and seems to be getting enlarged. Laparoscopic surgery is performed under general anesthesia. He is ideal for these situations. Laparoscopic inguinal hernia surgery is an established technique, which is appropriate for the managing of the majority of groin hernias. There are two means of repairing of inguinal hernia. In most of the cases it requires surgery. The most frequent approach to do away with hernia is open surgery. Groin hernias can likewise be repaired laparoscopically. In the early phases of hernia these steps could be useful. The hernia can return. Most hernias take a surgical procedure. Hernia is an issue that could be found in both women and men. If hernias are on either side, both hernias can be repaired at exactly the same time with no need for a 2nd large incision. It is a problem that can never self cure. Inguinal hernia is quite typical in hernia. Inguinal hernia are typical in preterm infants. Indirect inguinal hernia is quite typical in infants.